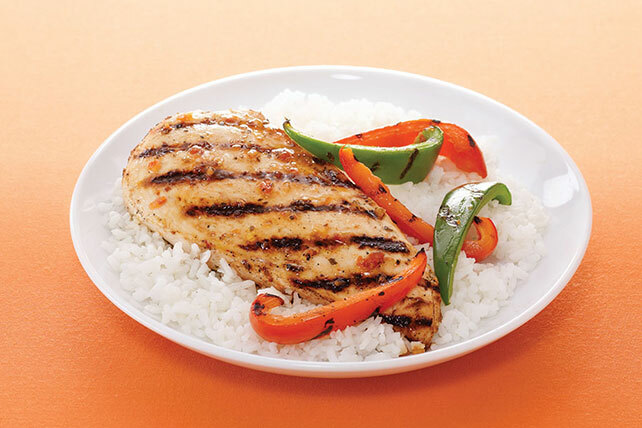 Chicken breasts and peppers get a quick marinade in sun dried tomato vinaigrette dressing before they're grilled to perfection and served on brown rice. Pour 1/4 dressing over combined chicken and peppers in shallow dish. Refrigerate 10 min. Remove chicken and peppers from dressing; discard dressing. Grill chicken and vegetables 12 to 15 min. or until chicken is done (165°F) and peppers are crisp-tender, turning and brushing occasionally with remaining dressing. Substitute 1 quartered zucchini or 2 cups whole mushrooms for the red and green peppers.